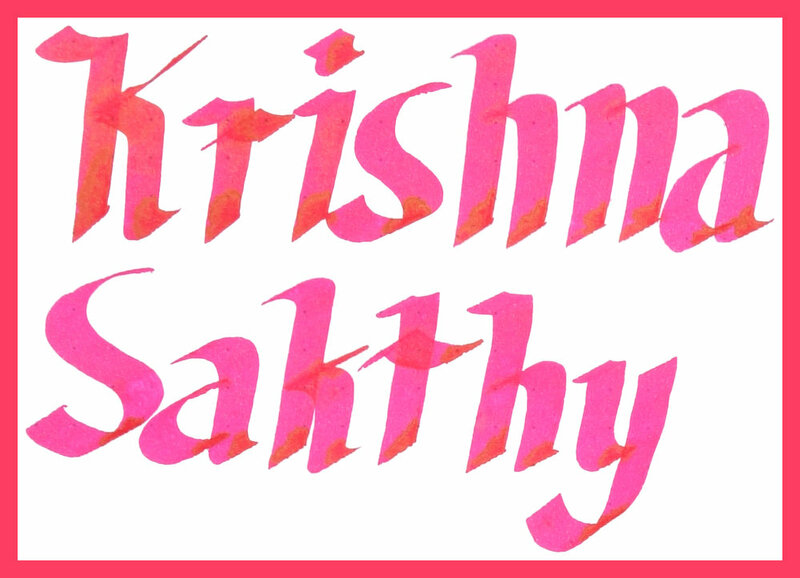 Krishna Sakthy is a bright pink that can be a pretty hot pink on the right paper but a little softer on other papers. It's a saturated pink and rather bright but isn't eye-searing on white paper, at least for me. Performance of this ink is pretty impressive. It creates sheen on cheap Composition Book paper with no feathering and no bleeding. For comparison Organics Studio Ralph Waldo Emerson Twilight Blue which has crazy strong sheen doesn't sheen at all on this paper. The ink is relatively wet but not to Sailor or Colorverse levels of wetness and is well lubricated. 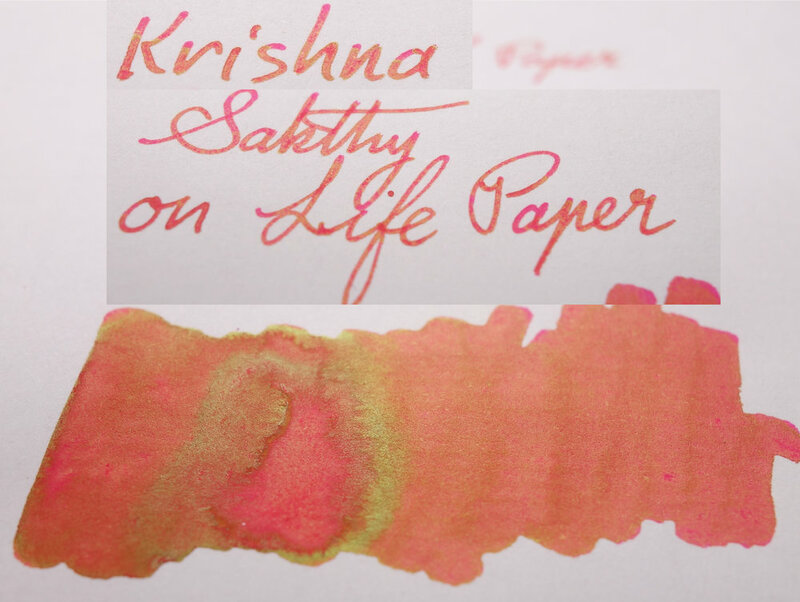 While not uncommon on pink inks this Krishna Sakthy sports a lovely golden sheen which is prevalent on most paper. It changes how the sheen presents a little depending on the paper for example on Life Paper it's more of a matte sheen across the whole line or swatch but on Rhodia it's only where the ink pools. It is impressive that this ink get sheen out of Clairefontaine, Leuchtturm1917 and cheap fountain pen unfriendly paper. On Tomoe River the sheen presents as a matte cover and at the edge of the line which is pretty interesting. Chromotography is uneventful. going from a slightly cooler pink to an actual eye-searingly hot pink. Dry time on Rhodia is rather fast and is quite fast indeed on Tomoe River. I tried to pick a combination of pinks from similar colours to popular to significant colours. Diamine Pink is a comparable ink; it has the gold sheen but is missing the saturation a little and is noticeably more orange. Montblanc Pink is far too cool and doesn't have the sheen, at least on Rhodia. Lamy Neon Coral has too much orange in the base ink colour but does have some sheen (though not as much). 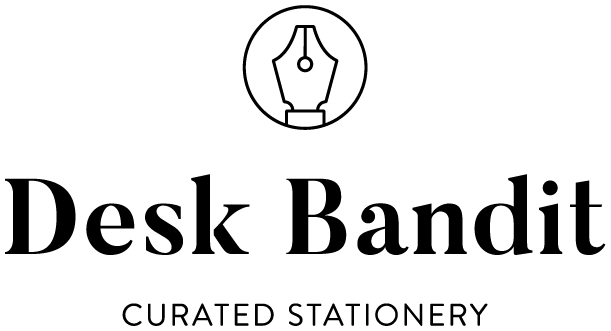 Iroshizuku Tsutsuji is far too dark and too cool. Finally, Sailor Mitsukoshi Hana Hiraku is just too saturated, too red, and too hot but it does have the sheen. On 52gsm Ivory Tomoe River Sakthy is not is saturated and is a softer colour. Similarly, Diamine Pink has softer as well, even more so. Montblanc Pink has gotten hotter and Lamy Neon Coral is flatter and also still a little too orange. As with Rhodia, Iroshizuku Tsutsuji is too dark and cool and Mitsukoshi Hana Hiraku is too hot and red. 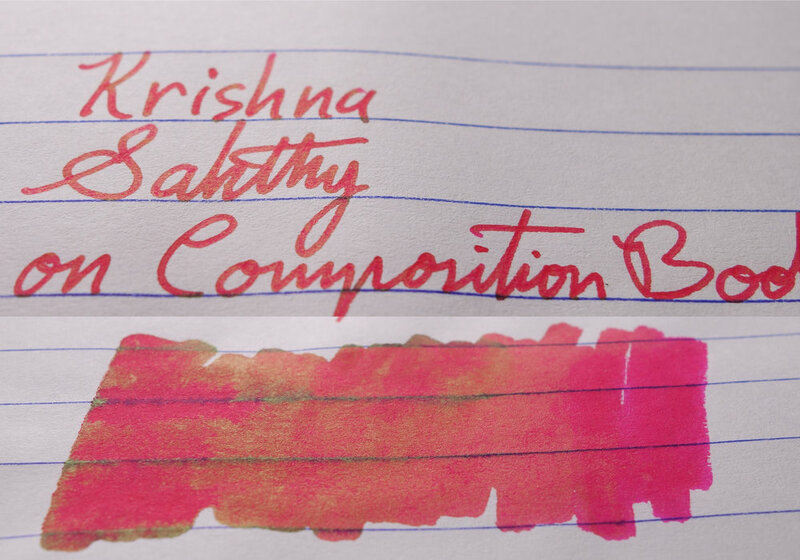 Even though Diamine Pink and Lamy Neon Coral are much more orange Krishna Sakthy, because of the general matte sheen to Sakthy the ink actually appears somewhat orange itself even if the base ink colour is quite different. 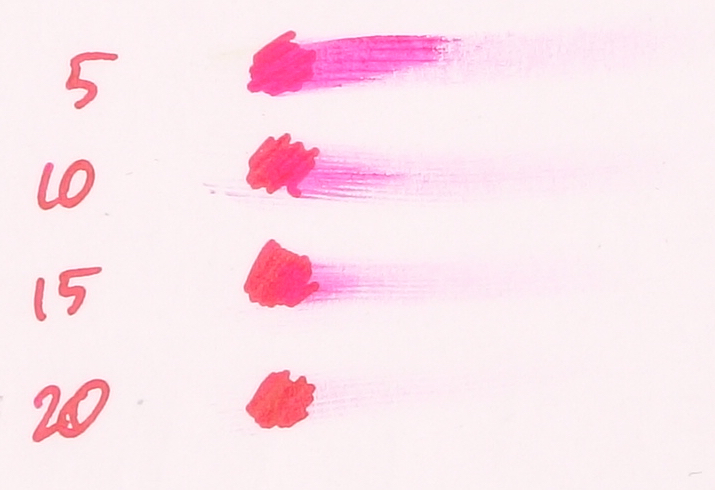 The sheen of Diamine Pink is a similar kind of more matte sheen, similarly with Lamy Neon Coral. 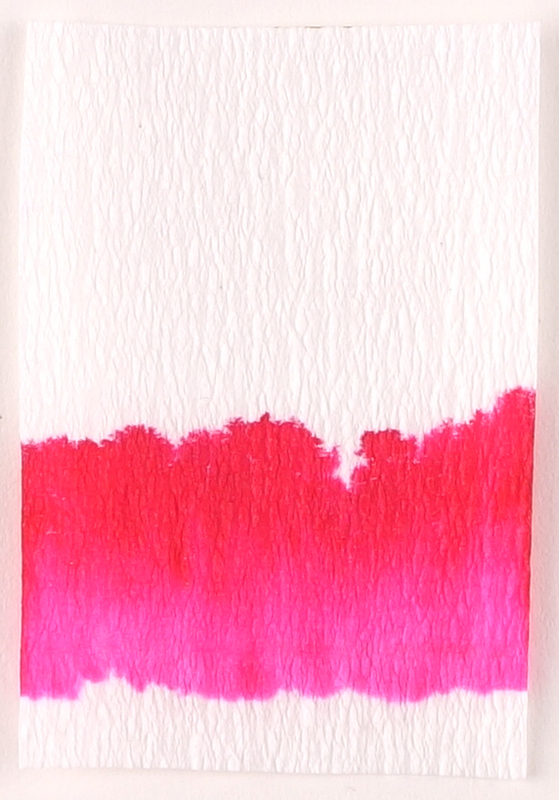 The sheen of Hana Hiraku, Tsutsuji, and Montblanc Pink are more where the ink pools. Montblanc Pink and Tsutsuji's sheen is also a little more green. Hana Hiraku's golden sheen is a bit stronger, at least on Tomoe River, when compared to Sakthy. Bright pink inks are a difficult ink. They are eye catching and pretty but definitely far from a "business appropriate" colour. 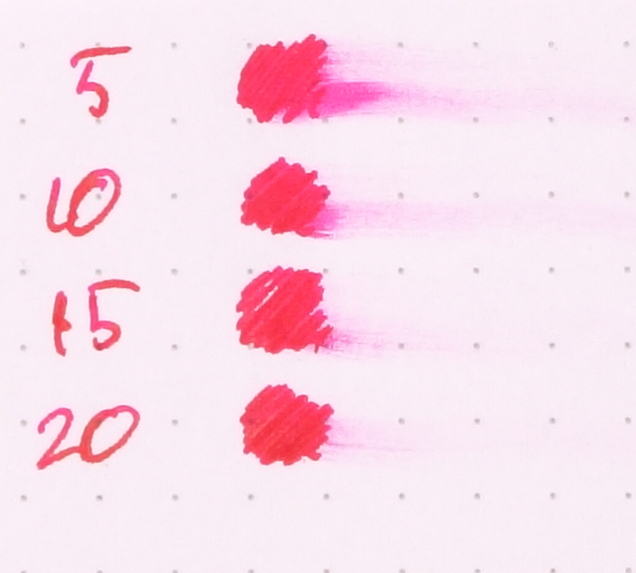 The fact that this ink performs so well on cheap paper might be lost to that when we need to write on cheap paper it probably isn't recommended to use a hot pink! This pink ink does have very good performance and has a nice vibrant gold sheen over a vibrant pink base. It's not as unique a colour as Krishna Brown Pink but it is a solid pink that works well almost everywhere. 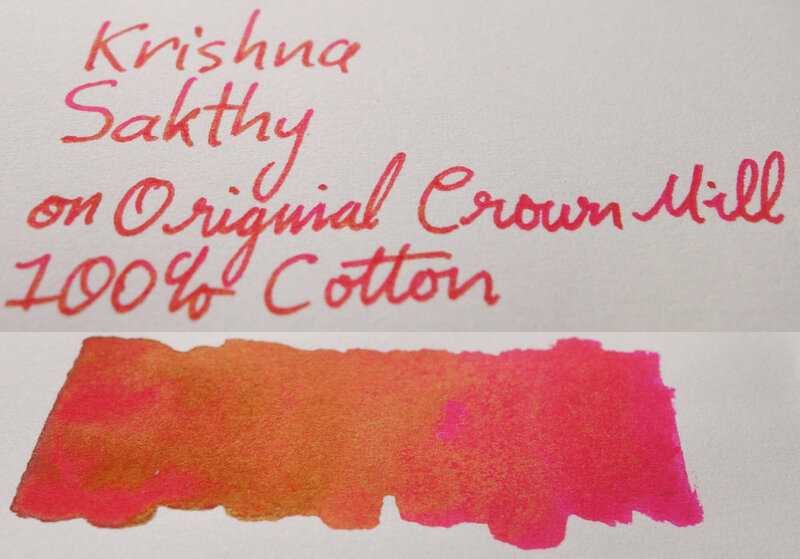 You can grab Krishna Inks from The Pen World (you'll have to email them if not in India), Pen Chalet, Vanness and iZods.